This collection has a fair SF as opposed to fantasy content. A new edition is available from Wildside Press. 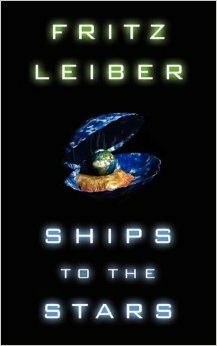 Ships to the Stars collects six Leiber stories, dating from 1950 through 1962. 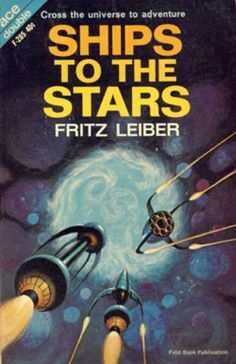 None of them qualify as major Leiber, but they are decent work, as one would certainly expect. I’ll treat them one by one. This is a Velikovskian story (the Dr. Kometevsky of the title is transparently Velikovsky). At some time in the future, the members of a group marriage are among those who realize, against their will, that the planets are of a sudden acting like “Dr. Kometevsky” predicted — beginning with the disappearance of Phobos and Deimos. The explanation is not quite what Velikovsky might have predicted (and the story as a whole is profoundly skeptical of Velikovsky). It’s interesting enough, but not special — more interesting, perhaps, is the look at the dynamics of a group marriage. A curious little piece, almost a precursor of the New Wave. The viewpoint character becomes part of a multi-species “trek” across what seems to be a devastated Earth — the moral being the value of continued exploration of space as opposed to stagnation on Earth and the concomitant destruction of Earth. A curious story about a far future man who conceives of himself as a “Wild One” in a regimented society. He has escaped, carrying the “seed” of his fellow Wild Ones, and he ends up on a mysterious planet, encountering what seem to be the same people again and again, in a sort of medieval milieu. The explanation is satisfactorily SFnal, but not terribly interesting. The Solar System is under attack by inscrutable aliens, and a ship that was intended by be a Sun explorer is suddenly an unlikely warship, drifting near Uranus. The captain’s desperate maneuver around the big cold planet ends up revealing something of the true and somewhat surprising nature of the aliens. 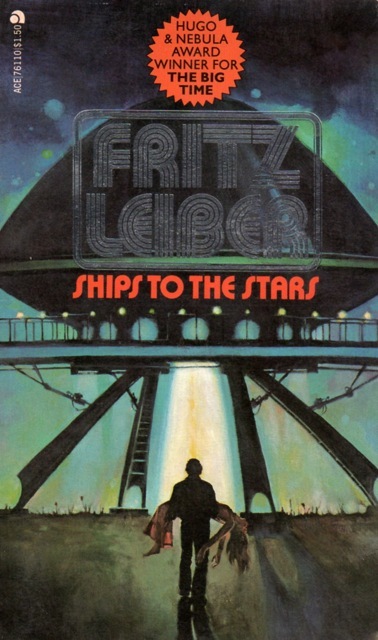 A Leiber attempt at something of a hard SF story that didn’t come off for me. This story struck me as almost a Sturgeon pastiche, but if written in 1950 it predated most of the stories one would describe as characteristically “Sturgeonesque”. A group of four somewhat Bohemian young people encounter a mysterious and beautiful woman, shortly after some UFO reports. She inspires them to think differently than they have, to become truly original rather than tiredly retreading fashionable ideas. The narrator falls in love with her and she with him. But is she really human? And what happens when her fellows finally return? And can humans really free themselves from their natures? I think this easily the best story in this book, and as I said, very Sturgeonesque.